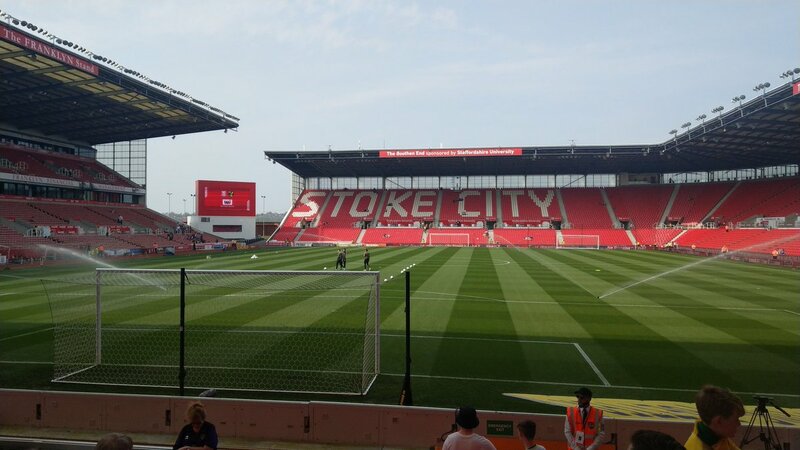 Stoke City is a Premier League Football Club that is based in Stoke-on-Trent, England. Since the team was founded in 1863, they are the oldest team in Premier League Football, and sometimes thought to be the second oldest football club in the world. 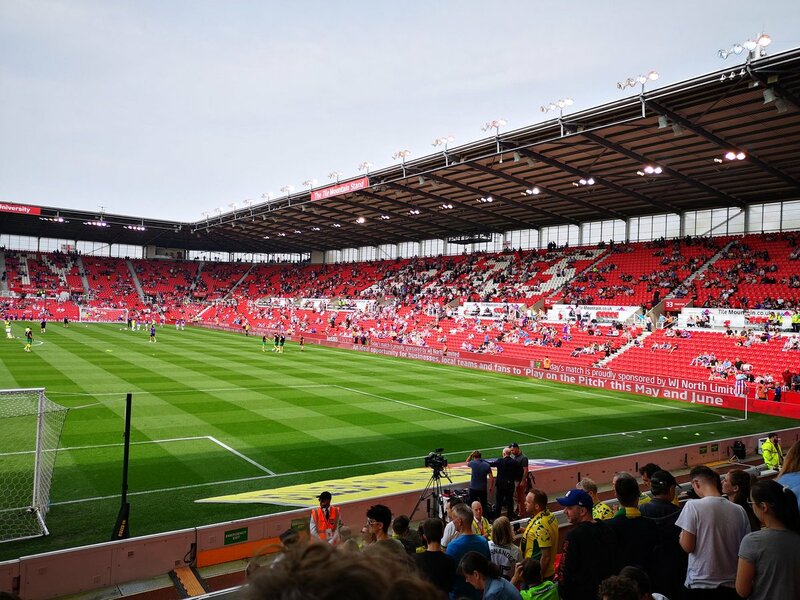 Stoke City spent their first 119 years playing their games at the Victoria Ground until 1997 saw them move to the 28,000 seat Brittania Stadium where they currently play their matches. In August of 1885, the club turned professional and were one of the twelve founding members of The Football League. Their first two professional seasons saw Stoke City finish bottom of the table for both seasons. League football was suspended for many years during the war-times, and Stoke City saw promotion from the Second Division in the 1932-1933 season. By 1934, the teams attendance had risen so much, that they were considered one of the top teams in the country. In 1939, the League was suspended for another 6 years, which put a hamper on Stoke City's impressive run. The 1963-1964 Season saw Stoke City once again back in the First Division. The 1967 Season saw something not witnessed by many fans or players. They were, for only one season mind you, transferred to the United States and played as the Cleveland Stokers playing in the United States Soccer Association. The first significant trophy win for Stoke City came in March of 1972 as they beat Chelsea 2-1 to claim the League Cup Final. The 1989-1990 Season saw Stoke City relegated to the Third Division. They finished 15th Place the following Season. However, in 1991, Stoke City won the Football League Trophy and were promoted from the Third Division. 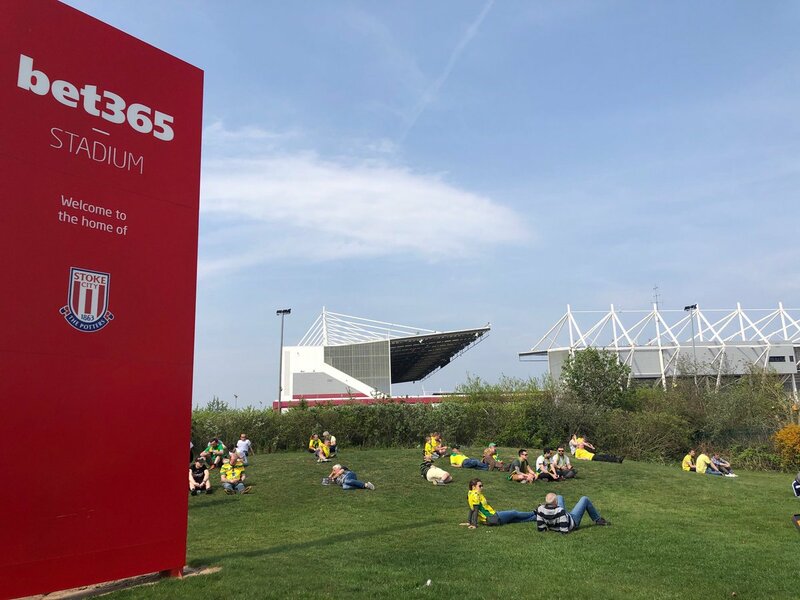 The move to Brittania Stadium in 1997 saw Stoke City floundering around both the First and Second Divisions until 2008 saw them promoted to the Premier League, or Top Tier, for the first time since the 1984-1985 Season. Some of the most notable trophies that have been won by Stoke City include the League Cup in 1971-1972, the Watney Cup in 1973, and many others. They have also won the Staffordshire Senior Cup 13 times over their history. 90'+6' - Second Half ended - Stoke City 2, Norwich City 2. 90'+5' - Corner - Norwich City. Conceded by Ryan Shawcross. 90'+5' - Shot blocked. Maximillian Aarons - Norwich City - shot with right foot from the right side of the box is blocked. Assist - Ben Godfrey. 90'+4' - Marco Stiepermann - Norwich City - won a free kick on the right wing. 90'+2' - New attacking attempt. Ben Godfrey - Norwich City - shot with right foot from the right side of the six yard box is saved in the left corner. 90'+1' - Corner - Norwich City. Conceded by Danny Batth. 90' - Missed chance. Kenny McLean - Norwich City - shot with left foot from more than 35 yards missed to the left. 89' - Missed chance. Marco Stiepermann - Norwich City - header inside of six yard box - left side is close, but missed to the left. Assist - Emiliano Buendía with a cross after corner. 89' - Corner - Norwich City. Conceded by Danny Batth. 86' - New attacking attempt. Mario Vrancic - Norwich City - shot with right foot from outside the box is saved by goalkeeper in the centre of the goal. Assist - Emiliano Buendía. 86' - Shot blocked. Jamal Lewis - Norwich City - shot with right foot from the left side of the box is blocked. Assist - Moritz Leitner. 84' - Missed chance. Jamal Lewis - Norwich City - shot with left foot from the left side of the box missed. Assist - Mario Vrancic. 84' - Teemu Pukki - Norwich City - won a free kick in attack. 83' - Substitution - Norwich City. Moritz Leitner for Onel Hernández. 81' - Substitution - Stoke City. Nathan Collins for Thomas Edwards. 80' - Delay in match Thomas Edwards - Stoke City - - injury. 79' - Marco Stiepermann - Norwich City - won a free kick in attack. 77' - Emiliano Buendía - Norwich City - won a free kick in defence. 75' - Corner - Norwich City. Conceded by Danny Batth. 74' - Shot blocked. Jamal Lewis - Norwich City - shot with left foot from outside the box is blocked. Assist - Mario Vrancic. 74' - New attacking attempt. James McClean - Stoke City - shot with right foot from outside the box is saved in the left corner. 71' - Missed chance. James McClean - Stoke City - shot with right foot from the centre of the box is high and wide to the right. Assist - Sam Clucas. 71' - Missed chance. Maximillian Aarons - Norwich City - shot with left foot from outside the box is close, but missed. Assist - Marco Stiepermann. 69' - GOAL!!! Stoke City 2, Norwich City 2. Thomas Edwards - Stoke City - shot with right foot from the right side of the box to the left corner. 68' - Shot blocked. Tom Ince - Stoke City - shot with left foot from the left side of the box is blocked. 67' - Substitution - Stoke City. Tom Ince for Thibaud Verlinden. 66' - GOAL!!! Stoke City 1, Norwich City 2. Teemu Pukki - Norwich City - shot with the head from the centre of the box to the right corner. Assist - Mario Vrancic. 65' - Joe Allen - Stoke City - won a free kick in defence. 64' - Missed chance. Sam Clucas - Stoke City - shot with left foot from the centre of the box is very close to the goal. 64' - Missed chance. Joe Allen - Stoke City - shot with the head from the centre of the box missed to the left. Assist - Thomas Edwards with a cross. 62' - Christoph Zimmermann - Norwich City - won a free kick in defence. 61' - James McClean - Stoke City - won a free kick on the left wing. 60' - Offside - Norwich City. Mario Vrancic with a pass, however Onel Hernández is in offside. 59' - Delay in match Sam Clucas - Stoke City - - injury. 58' - Missed chance. Joe Allen - Stoke City - shot with left foot from outside the box goes high after corner. 58' - Corner - Stoke City. Conceded by Ben Godfrey. 56' - New attacking attempt. James McClean - Stoke City - shot with the head from the centre of the box is saved by goalkeeper in the centre of the goal. Assist - Thomas Edwards with a cross. 54' - Substitution - Norwich City. Mario Vrancic for Tom Trybull. 54' - Corner - Norwich City. Conceded by Peter Etebo. 54' - New attacking attempt. Peter Etebo - Stoke City - shot with right foot from outside the box is saved in the left corner. Assist - Ashley Williams. 53' - Corner - Stoke City. Conceded by Kenny McLean. 53' - Shot blocked. Sam Clucas - Stoke City - shot with left foot from outside the box is blocked. Assist - Thomas Edwards. 51' - New attacking attempt. Thibaud Verlinden - Stoke City - shot with right foot from outside the box is saved in the top right corner. Assist - Joe Allen. 50' - Emiliano Buendía - Norwich City - won a free kick in attack. 47' - GOAL!!! Stoke City 1, Norwich City 1. Ashley Williams - Stoke City - shot with the head from the centre of the box to the top right corner. Assist - Thibaud Verlinden with a cross after corner. 47' - Corner - Stoke City. Conceded by Ben Godfrey. 47' - Shot blocked. Benik Afobe - Stoke City - shot with left foot from the centre of the box is blocked. Assist - Joe Allen. 46' - Danny Batth - Stoke City - won a free kick in defence. 45' - Second Half starts Stoke City 0, Norwich City 1. 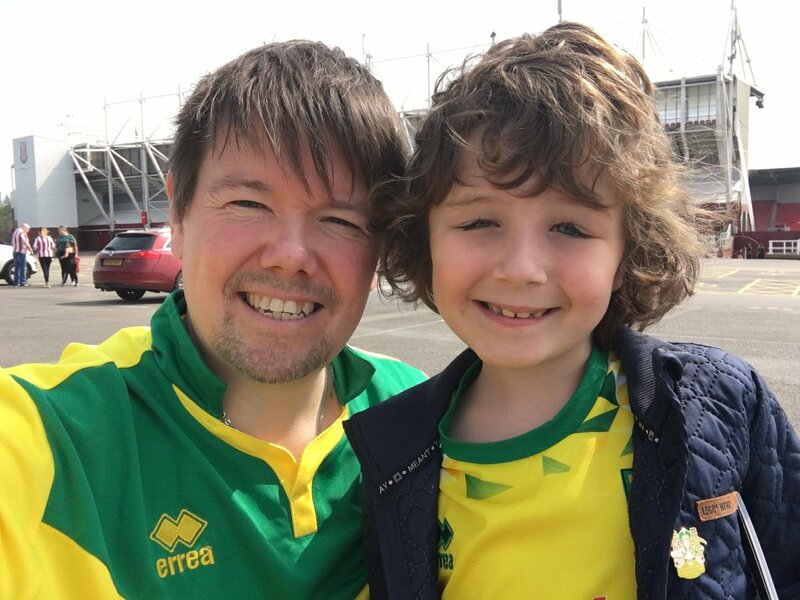 45'+2' - First Half ended - Stoke City 0, Norwich City 1. 45'+1' - New attacking attempt. James McClean - Stoke City - shot with right foot from outside the box is saved in the left corner. Assist - Sam Clucas. 40' - Offside - Stoke City. Peter Etebo with a pass, however Benik Afobe is in offside. 39' - Maximillian Aarons - Norwich City - won a free kick on the right wing. 37' - New attacking attempt. Danny Batth - Stoke City - shot with left foot inside of six yard box - left side is saved by goalkeeper in the centre of the goal. Assist - Thomas Edwards with a cross. 36' - Corner - Stoke City. Conceded by Maximillian Aarons. 35' - Marco Stiepermann - Norwich City - won a free kick on the left wing. 34' - Jamal Lewis - Norwich City - won a free kick on the left wing. 32' - Missed chance. Peter Etebo - Stoke City - shot with right foot from outside the box is close, but missed to the left. Assist - Ashley Williams. 31' - Corner - Stoke City. Conceded by Emiliano Buendía. 31' - Missed chance. Ben Godfrey - Norwich City - shot with the head from the centre of the box missed. Assist - Emiliano Buendía with a cross after corner. 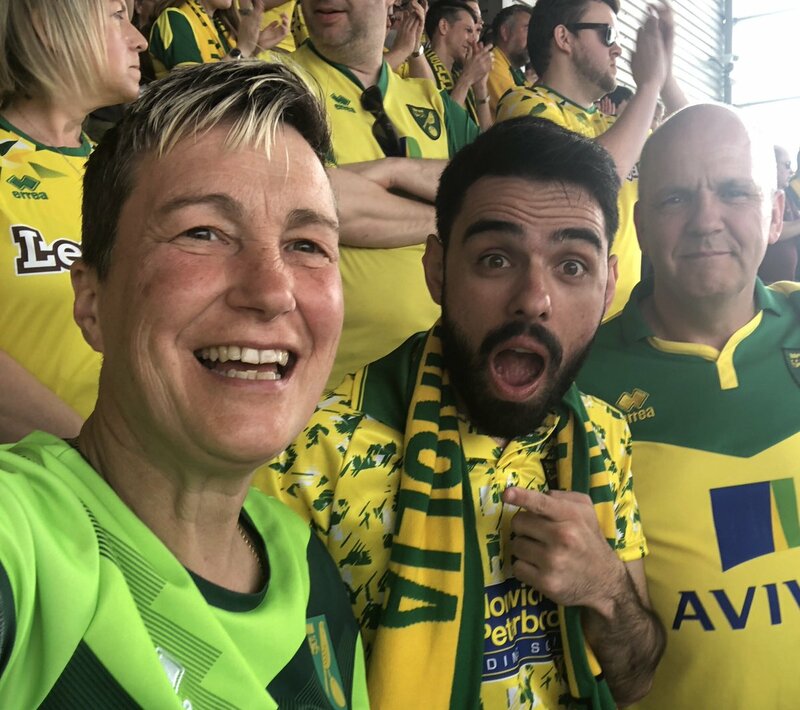 30' - Corner - Norwich City. Conceded by Sam Clucas. 30' - Shot blocked. Teemu Pukki - Norwich City - shot with right foot from the left side of the box is blocked. Assist - Kenny McLean. 26' - Shot blocked. Teemu Pukki - Norwich City - shot with right foot from the left side of the box is blocked. Assist - Marco Stiepermann with a through ball. 24' - GOAL!!! 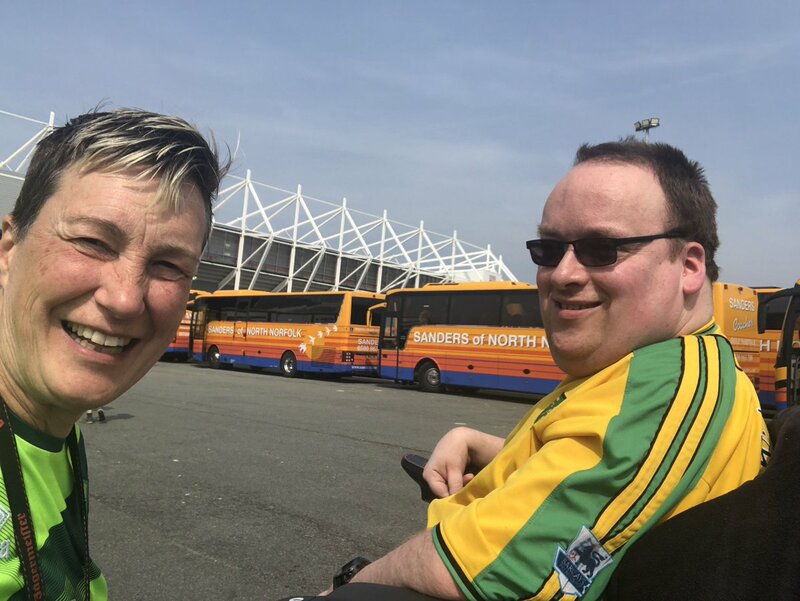 Stoke City 0, Norwich City 1. Onel Hernández - Norwich City - shot with right foot from the left side of the box to the left corner. 21' - Kenny McLean - Norwich City - won a free kick in attack. 20' - New attacking attempt. Thibaud Verlinden - Stoke City - shot with right foot from outside the box is saved in the left corner. Assist - Thomas Edwards. 19' - New attacking attempt. Teemu Pukki - Norwich City - header inside of six yard box - left side is saved by goalkeeper in the centre of the goal. 19' - Emiliano Buendía - Norwich City - won a free kick in attack. 13' - Joe Allen - Stoke City - won a free kick in defence. 12' - Thibaud Verlinden - Stoke City - won a free kick in attack. 11' - Missed chance. Sam Clucas - Stoke City - header inside of six yard box - left side is high and wide to the left. Assist - Thomas Edwards with a cross. 8' - Maximillian Aarons - Norwich City - won a free kick in defence. 6' - Missed chance. Marco Stiepermann - Norwich City - shot with left foot from outside the box goes high. Assist - Tom Trybull. 4' - Emiliano Buendía - Norwich City - won a free kick in defence. 3' - Missed chance. Onel Hernández - Norwich City - shot with right foot from outside the box missed to the left after corner. 3' - Corner - Norwich City. Conceded by Ashley Williams.